Glenn is an international authority on QFD and leading Kansei trainer in the U.S. He is the Executive Director of the QFD Institute and International Council for QFD, president of Japan Business Consultants, and the Convenor of ISO Working Group 2 Technical Committee 69 Subcommittee 8 (ISO 16355). A Japanese quality specialist since 1980, he has studied and worked with Japanese quality masters, including Dr. Yoji Akao (founder of QFD), Dr. Mitsuo Nagamachi (founder of Kansei Engineering), and Dr. Noriaki Kano, teaching QFD seminars side by side during many of Dr. Akao's visits to U.S. companies. Fluent in Japanese, Mazur is one of a few Westerners who can articulate often too foreign and inexplicable oriental concepts with intelligibility and accuracy appreciated by English-speaking audience. Glenn is a recipient of the 1998 Akao Prize® for Excellence and one of the only two non-Japanese to be certified as QFD Red Belt® by Dr. Yoji Akao (the highest QFD mastery level). He has taught Total Quality Management at the University of Michigan School of Engineering for 10 years, delivered many keynotes at international quality conferences, written over a hundred articles and papers on QFD and quality methodologies, and trained numerous QFD Green Belts® and QFD Black Belts® worldwide since 2000. Mazur is a senior member of ASQ (American Society for Quality), an Academician in the International Academy for Quality (IAQ) and the convenor of ISO Working Group for writing the International QFD Standards. In 2014 Glenn received the Founders Medal by the International Academy for Quality, Best Paper Award by the European Organization for Quality, and was also recognized by Thomson Reuters 2014 Journal Citation Reports® for the impact factors of his paper in Quality Engineering Journal. Please see the right column for the work samples and projects by Glenn H. Mazur. 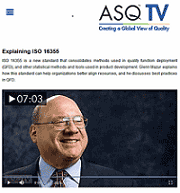 President, Japan Business Consultants, Ltd.
2016 European Organization for Quality Congress: "ISO 16355: A Quality Approach to New Product Development"
2016 ASQ World Conference on Quality and Improvement: "ISO 16355: A Standard for Innovative Customer Experience"
2014 North American Symposium on QFD: "Driving Your QFD with ISO 16355"
2014 ASQ Technical Community Conference: "Delighting Customers in Health Care Using QFD"
2014 International Symposium on QFD: Keynote "QFD and the New Voice of Customer (VOC)"
2014 International Symposium on QFD: "The Contribution of the QFD Methodology for a Customer and Market-oriented Product Planning and Development Process"
2014 European Organization for Quality Congress in Sweden: ""Design for Customer Satisfaction using QFD and ISO 16355"
2013 International Symposium on QFD: Keynote "QFD for Membership Organizations — Practicing What We Teach"
2011: "Using QFD to Design a Multi-Disciplinary Clinic"
2011: "QFD Applications for the Board of Directors"
2010: "Integrating QFD into Phase-Gates Product Design"
2009: "Why We Drink Beer: Using QFD, Kansei, and AHP to Understand How Consumers Identify with Brands"